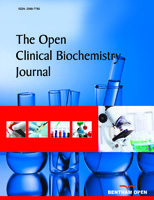 The Open Clinical Biochemistry Journal is an Open Access online journal, which publishes Research, Reviews, Letters articles and Guest Edited Single Topic Issues in the field of in the field of Dentistry and oral cavity, aiming at providing the most complete and reliable source of information on current developments in the field. Mini-reviews should be 6000- 10000 words with 75 or more references excluding figures, structures, photographs, schemes, tables etc. This journal publishes open access reviews on recently published books (both print and electronic) relevant to the journal. Publishers and authors of books are invited to contact our book reviews editor at tocchemj@benthamopen.net with book review requests. All submitted books will be reviewed by an independent expert in the field. No page charges will be levied to authors for the publication of book reviews. For proposals to publish conference proceedings in this journal, please contact us at email: proceedings@benthamopen.net. The title should be precise and brief and must not be more than 120 characters. Authors should avoid the use of non standard abbreviations and question marks in titles. The title must be written in title case except for articles, conjunctions and prepositions. Authors are encouraged to consult reporting guidelines. These guidelines provide a set of recommendations comprising a list of items relevant to their specific research design. All kinds of measurements should be reported only in International System of Units (SI). Chemical equations, chemical names, mathematical usage, unit of measurements, chemical and physical quantity & units must conform to SI and Chemical Abstracts or IUPAC. If abbreviations are used in the text either they should be defined in the text where first used, or a list of abbreviations should be provided. Author(s) and Reviewers must be informed in case of misinterpretation or mishandling of International Acceptable Standards. A strict notice should be sent to the author and reviewer to avoid future unethical misconduct. An Editorial on the reported misconduct should be published or official notice of unethical behavior should be posted on the website. Where required, retraction and withdrawal of publication may be undertaken from the Publisher’s journal in discussion with the Head of the Department of the author or reviewer, and other higher authorities should be informed. The Publisher may impose restrictions for some period on future publications from the accused author in the journals. A specific declaration of such approval and consent-to-disclose form must be made in the cover letter and in a stand-alone paragraph at the end of the Methods section especially in the case of human studies where inclusion of a statement regarding obtaining the written informed consent from each subject or subject's guardian is a must. The original should be retained by the guarantor or corresponding author. Editors may request to provide the original forms by fax or email. Botticelli D, Berglundh T, Lindhe J. Hard-tissue alterations following immediate implant placement in extraction sites. J Clin Periodont 2004; 10: 820-8. Clarkson JJ. International collaborative research on fluoride. J Dent Res 2000; 79: 893-904. Hilton TJ. In: Schwarts RS, Summitt JB, Robbins JW, Ed. Fundamentals of Operative Dentistry. Chicago, Quintessence Publishing 1996; 207-28. Lindhe J, Lang NP, Karring K. Periodontology and Implant Dentistry. 4th ed. Oxford: Blackwell Munksgaard 2003. Nakabayashi N, Pashley DH, Eds. Hybridization of Dental Hard Tissues, Tokyo: Quintessence Publishing 1998. Anderson JC. Current status of chorion villus biopsy. In: Tudenhope D, Chenoweth J, Eds. Proceedings of the 4th congress of the Australian perinatal society; 1986: Brisbane, Queensland: Australian Perinatal Society 1987; pp. 190-6. Crane D. Invisible colleges: Diffusion of knowledge in scientific communities. Chicago: University of Chicago Press 1972. Seghatol M, inventor; Jean-Pierre Durand, assignee. Microwave polymerization system for dentistry. United States Patent US 6441354 2002 Aug.
 Robert LK. Aspects of the use of design of magnetism in dentistry. Ph.D. diss., Dept. of Dentistry, Hong Kong Univ 1999b. Sosan P, Flarris AM. Contemporary implant dentistry 1999 Vol. 12. Forthcoming. All authors must strictly follow the guidelines below for preparing illustrations for publication in The Open Clinical Biochemistry Journal. If the figures are found to be sub-standard, then the manuscripts will be rejected. The publication fee for each published letter article / short communication / case report submitted is US $750. An optional fast publication fee-based service called “QUICK TRACK” is available to authors for their submitted manuscripts. QUICK TRACK allows online publication within 1 week of receipt of the final approved galley proofs from the authors. The total publication time, from date of first receipt of manuscript to its online publication is only 6 weeks, subject to its acceptance by the referees and modification (if any) by the authors within one week. Authors who have availed QUICK TRACK services in a Bentham Open journal will be entitled for an exclusive 30% discount if they again wish to avail the same services in any Bentham Open journal within the next 12 months. Bentham OPEN offers ‘Complimentary Membership’ to International R & D organizations, institutes and universities. Bentham OPEN Membership entitles authors from different member institutes to a special discount of 50% on the open access publication fee on their submissions to Bentham OPEN journals. Additionally, input and contributions from associate institutes would also be recognized and a link to their respective Website would be displayed on the Bentham OPEN membership page. The member institution’s logo will also be published on the same page.